What follows is a collection of some of the things I use in my day-to-day as a working musician. Anything you see here is tried and tested and is something I would recommend to anyone because I love it – not because you need it. These are the things that make my life in music easier, better, and more enjoyable. This article contains affiliate links. These don’t cost you anything, but help offset the cost of this site via a small commission. 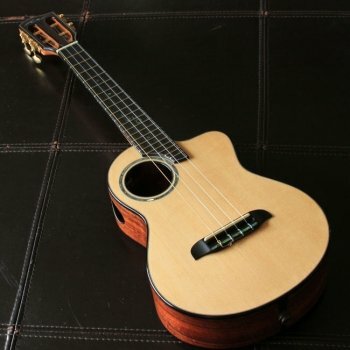 I have one really nice ‘ukulele and a number of standard models that each serve a purpose. I’ve collected a few more over the years, but those shown here get all the play time. I’m a big believer of keeping life simple. If I could get away with having only one ‘ukulele, I would. My priceless, one-of-a-kind, world-class ‘ukulele. 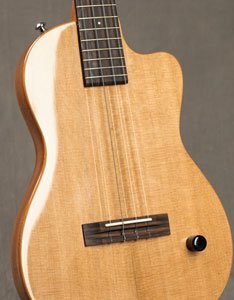 Chuck is one of the most sought-after ‘ukulele luthiers in the world and happens to be my good friend (which certainly helped in getting on his build list). This spruce top, koa back/sides uke is my main instrument these days. It’s a complete joy to play. Read more about my Moore Bettah. My exceptional stock Kamaka was my main instrument for almost a decade, with battle scars to prove it. Best $700 I’ve spent so far in my life. 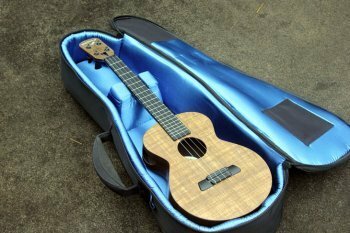 I’m biased, but if you need a handmade Hawaiian tenor, look for a Kamaka HF-3. Read more about my Kamaka. A totally crankin’ baritone that’s great for a rock look and concert volume. Pono makes a really nice baritone and their BE-DC is no exception. It plays well and is built like a tank. I replaced the stock pickup with a MISI and like the string-to-string balance and tone better. I just strung it up for the first time with Savarez Alliance high-tension (blue pack) trebles (E and B) and Thomastik-Inkfield CF30 and CF35 for the G and D strings. Best set I’ve yet tried on it. I imagine I’ll be using these lots in the future. My review of the BE-DC. After a bad experience gigging in the rain I decided to purchase an ‘ukulele purpose built for sturdiness and soggy conditions. The Farallon has been fabulous insurance for unknown playing environments. I don’t have to worry about it very much and it sounds great. It also plays better than almost any other uke! Read my review of the Farallon. You can have as many goodies as you like for your ‘ukulele, but at the end of the day there are some that are more useful than others. I never leave home without these! An extra set of strings is a must-have at all times. Period. 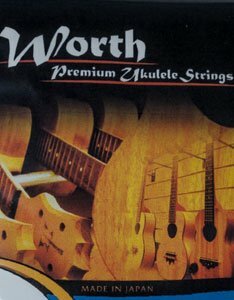 I’ve been using Worth for over a decade now and love their heavy tension and clear, punchy sound. With a daunting number of tension and size options, anybody should be able to find their happy place in the Worth lineup. Tiny tuning that’s accurate and fast (and cheap). 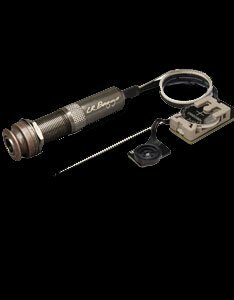 The NS Micro is close to invisible from an observer’s perspective, but is bright enough and accurate enough to useful onstage in almost any lighting enviroment. I had the 1st version for over five years (only changed the battery once) and have just recently upgraded to version two for no particular reason. The only time it comes off my uke is if someone needs to borrow it. Solid, simple, cheap, reliable protection. I have a bunch of Oahu case models. My favorite is their fiberglass case. I have a leather covered one and a plain white one. The only difference between them is looks and how well stickers stay on. 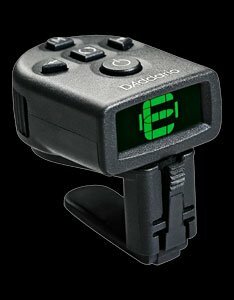 They seem substantial in the protection department – much more so than Crossrock’s similar 1000 model – and are compact. The placement of the strap clips are perfect for wearing it backpack style. I had an Ameritage Silver case for years that was also really nice (and REALLY heavy). It couldn’t handle the wet Hamakua environment though so I ended up giving it to a friend. If you need crazy protection in a less-than-80%-humidity climate, I’d definitely recommend one. A backup set of strings are always a must, as are spare batteries for your pickup. Besides that I’ve found that these are also some items that are good to have nearby. 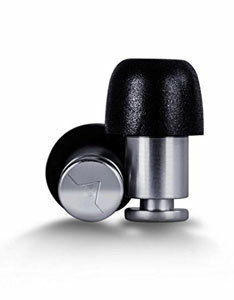 The best way to protect your ears in a musical environment is with custom-molded earplugs. I scored a free pair from the MusiCares program last year at a festival, but you can get them from any decent audiologist. Short of that Isolate Pro earplugs are a pretty cool deal. Besides looking great and feeling sturdy, they attenuate a ton of sound while retaining a fairly balanced frequency response. I use them for everything from band practice to chainsawing. I also used something very similar to these for years. Don’t have the abrasive texture and feel of other emery boards. 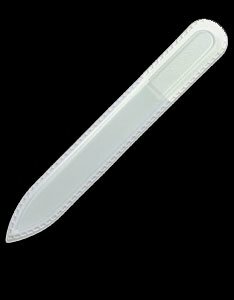 If you keep your fingernails long for picking you need one of these. I’ve got a decade on mine. Clear, warm sound that runs off of a tiny 3V watch battery. This UST type pickup is the best I’ve ever played and I often get complements on how good it sounds. 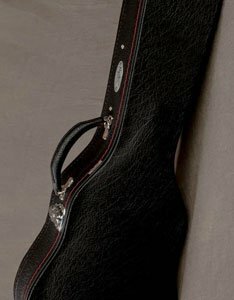 I never have to worry about my sound and can turn myself up or down with a little volume knob mounted in the soundhole. The optimum operating life of these batteries isn’t super long, but if you don’t mind your sound degrading a bit will last a long time. Sound and reliability are really all you can ask for in a cable. My Mogamis have seen my signal through hundreds of gigs without a crackle and with pure tone. They are all I will buy and have a lifetime replacement warranty. If you learn to solder you can save some serious bucks by buying bulk cable ($1.50-ish a foot) and some 1/4″ plugs ($2-6 a pop) and putting the pieces together yourself. 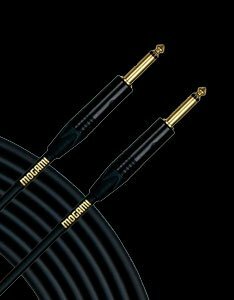 An 18′ Mogami Gold cable is $60, but if you make it yourself it’s around $32 in parts for basically the same quality. This is the route I’ll be going from now on. I used the LR Baggs Venue for a lot of years, but have recently switched to a more simple EQ/DI from Tech21. The Venue is great, but I got tired of the bulk and spotty tuning. 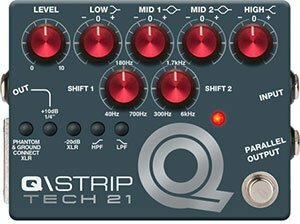 The Q\Strip is one of few parametric EQ pedals on the market and, though not specifically a preamp, I couldn’t tell much of a difference when A/Bing it and the Venue. If anything, the Q\Strip sounds a bit sweeter and the treble knob controls a more pleasing range of frequencies. Learn to dial in the EQ best for your instrument, ask to use it in place of the house DI, and soundmen everywhere will pretty much leave you alone because you’ll sound good as soon as they turn you up. A little bit a reverb or delay goes a long way towards making your ‘ukulele sound majestic plugged in. Other sounds that an effects pedal can provide are just additional colors to paint with. A little homemade pedalboard for small acoustic gigs that has my Q\Strip, TC Electronic Polytune Mini 2, TC Electronic Hall of Fame Mini, and MXR Carbon Copy on it powered by the Strymon Zuma R300 power supply. This is the most I’d ever need for any Hawaiian-style, background music event. The other is my trusty ME-70 stand-alone multi-effects for more adventure. This is what I bring along for rock, hip-hop, reggae, and other crazy music type gigs. For what it is, it’s a total no-brainer if you want to experiment with sounds. The learning curve is close to zero and it’s a quality unit. 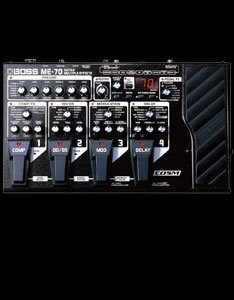 Boss is up to the next version already – the ME-80. But it’s basically the same thing, plus some cool new features. I’ll upgrade when my ME-70 dies – if ever. After deciding to move up from my Venue DI, I was in need for a simple tuner pedal. 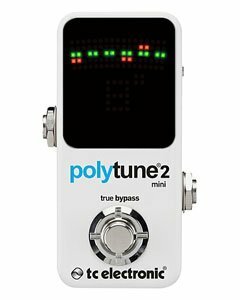 TC has been getting rave reviews for its Polytune line for a long time so the tiny Mini version seemed like an obvious choice. It’s very precise and fast and simple. Stomp on it and your signal mutes for tuning. There are other options, but the polytune feature is guitar specific and I haven’t been able to get it to work on a uke very well. A reverb pedal can be very simple. It seems a single knob will do – set it and forget it. 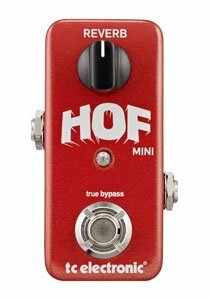 And despite the small footprint and lack of external features, the Hall of Fame sounds fabulous on my different settings. The beauty of TC’s Toneprint technology is that you can tune the sound of the pedal on your computer. Because of this I was able to create a dark plate that sits beautifully behind my ‘ukulele. You don’t often get this tweak-ability. Now that the sound is in my pedal, I can just adjust the mix with the knob and play. After selling my first carbon copy like a bozo, I recently got another. Why? Because it’s cheap, simple, small, and sounds awesome. Why buy some big, complicated digital machine when you can have the real-deal for a hundred bucks used? 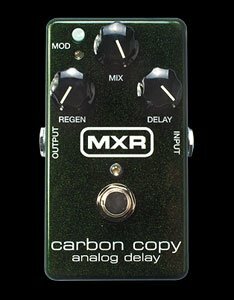 I like the way dark analog delay repeats sit with the uke’s sound. It’s very complementary, getting mushy as the repeats fade. Here’s why I like the Carbon Copy. Hawai’i has notoriously terrible power. Between that and the ancient wiring in old plantation-era buildings, hum, ground problems, and noise are almost a constant problem here. I bought a power supply from Strymon to keep my sound clean and my pedals happy. It’s the most boring piece of gear I’ve ever spent $200 on, but it’s totally worth it to keep my sound quiet. The R300 fits neatly under my little pedalboard and is one of the most low-profile power supplies available. A power supply is different than a daisy chain! I had a 1Spot for years and never realized how much noise it created. Buy the real deal if you want a truly pro setup. Having the gear to amplify yourself is a huge plus if you want to be a performing musician. 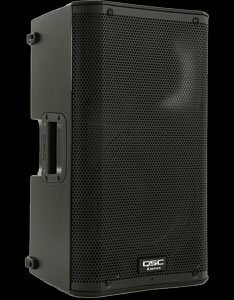 This is my setup for a crisp, mainly feedback-free PA that gets LOUD for its size! Active LOUDspeakers that are highly regarded for the price. These babies can slam 1000 watts a pop; I’ve never had to turn them up past halfway. They handle a bass guitar pretty well for 10″ speakers and are super overkill for an ‘ukulele. They can also be used independently as a two-channel “amp” since each speaker has a dual input mixer section. 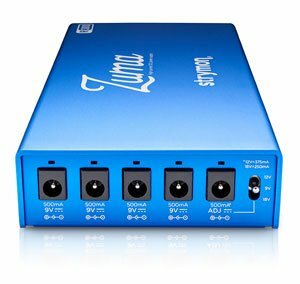 Great for small-ish gigs if you’re not picky about your EQ or are in a bind. 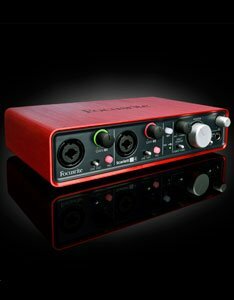 Top-quality preamps and build quality with a small footprint. The built-in effects are great and tweakable. Suitable for up to three-man bands since it’s really only a 6-channel board. Took me a while to get up the courage to drop $300 on a tiny little mixer, but it’s been totally worth it. The ZED sounds great, feels sturdy, and is about half the size of my old Mackie that had basically the same number of channels. 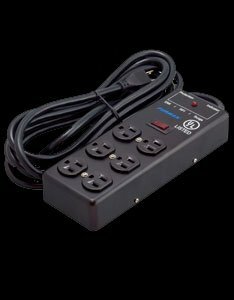 You can never have enough outlets onstage and this multi-strip provides a little extra protection for your expensive gear. I bring it anywhere I have to plug something of mine into the wall. My luck is the day I plug into someone else’s power strip I’ll blow up $2000 worth of equipment. Used to be that recording happened only during very expensive studio sessions in very expensive studios. These days though, with a few hundred dollars you can buy everything you need to create a fantastic recording in your bedroom. I recorded my EP, Point A, with the gear below (and lots of blankets on the walls). All I added for my latest album, If Only, was a Shure SM7 for tracking vocals. 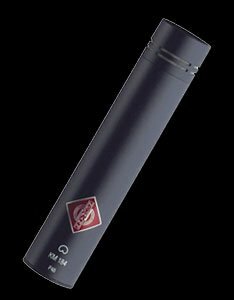 A crisp sounding, small diaphragm condenser mic perfect for ‘ukuleles. It’s tiny, but delivers a big sound. I’ve used the Neumann on two albums now and it makes recording ‘ukulele painless. I just put it in the sweet spot and know that it’s going to sound great. It’s pretty expensive, but worth every penny – especially if you end up using it on multiple projects. My buddies have borrowed it and I take it to outside recording sessions. It’s awesome to have a great uke mic that I’m familiar with. A two-channel USB interface with phantom power, MIDI ins/outs, and plenty of routing options for a simple setup. Comes with some cool plugins and records at a 24-bit, 96kHz sample rate. Sounds good, the mic preamps have a decent amount of gain. It’s not an Avalon, but I’m not sure what more you would need for basic uke tracking. Cubase is the DAW my friend was using the first time I ever recorded. It still does everything I need from a recording program. It has a beautiful interface and straightforward features that make editing simple. 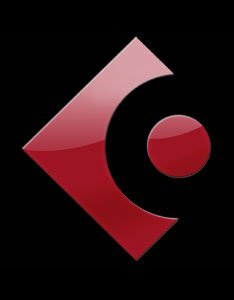 Steinberg is up to version 9.5 by now, but any DAW does basically the same thing. In this digital age, having the right tools on your computer make or break what you’re able to do and how easily you can do it. 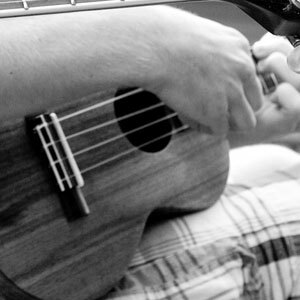 The open-source blogging platform that I use to run Live ‘Ukulele.com. Amazing features for free. 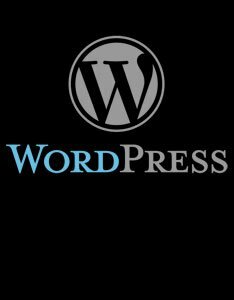 I’ve been running WordPress since the beginning and the effort and thought that goes into each version is really remarkable. At this point it’s kind of a no-brainer if you want to start a website. The sheer volume of themes and plugins (not to mention tutorials!) available (mostly for free) allow you to do pretty much anything you want with a website. I use the Thesis theme that I’ve customized for my needs. Clean, fast, great support. Recommended. A feature-rich tablature program that exports beautiful PDFs. It could use an upgrade to enable a couple style tweaks, but otherwise a great tool for the price. 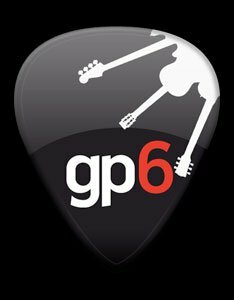 You can also download many, many tabs for GP6 and use other people’s work as a start for your own arrangements. GP7 is available now, but seems to have missed the mark from what I’ve heard. I’ll be sticking to V6 for now. 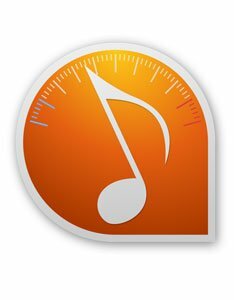 A fabulous slow-downer and pitch-shift program for learning songs. It allows you to change the key to fit your voice, learning chords by ear without the need to transpose. 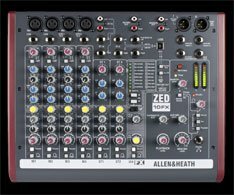 It includes a radical EQ/spatial filter that (depending on the mix) allows you to hone in on – or exclude – certain instruments and parts for easier listening.